Relationship Maps show the overall view. They show the departments of an organization and how they interact with suppliers and customers. Cross-functional Maps or Swim Lane Charts show which department performs each step and the inputs and outputs of each step. These maps have more detail than a relationship map but less than a flowchart. Process Flow charts or Process Flow Diagrams take a single step from a cross-functional map and expand it to show more detail. 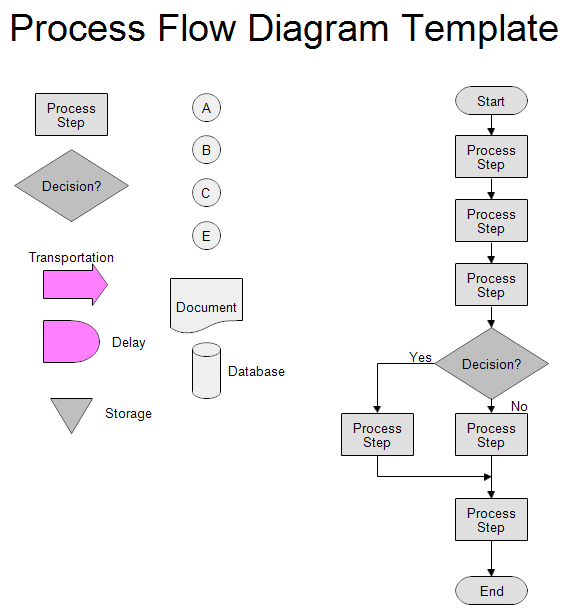 Process flow charts and process flow diagrams are the same thing. Maps and flowcharts help people understand a work process. They make the tasks, interfaces, inputs, and outputs more visible. Analyzing a process map may help reduce cycle time, reduce costs, and increase productivity. To download and modify the process flow chart shown above, see the Drawing Instructions below. Transportation or Movement shows that the goods are being moved between locations, like from one factory to another. Delay shows where goods are waiting in the factory or placed in temporary storage. Storage shows a longer delay or a delay that requires authorization to retrieve the goods. Inspection is a circle that shows where in a process the part will be inspected. Move the boxes around to show the steps in your process. Double-click the boxes to change the text. Connect these boxes with lines. Move the existing lines around or add new lines from the stencil at the left. You can drag lines and shapes from the stencils on the left into your chart. To duplicate a shape, right-click on it and choose Duplicate. To delete a shape, right-click on it and choose Delete.